I’ve been a recent convert to White Wolf’s World of Darkness system, and have enjoyed immensely playing Vampire the Requiem. My initial character was of clan Ventrue – almost by default – but after reading through the Nosferatu clan book, I think I know what clan affiliation my next character will have. Nosferatu describes the most repellent of the Kindred clans; the most disquieting vampires in the whole World of Darkness. No matter their sire, the vampires of this clan – Haunts, Freaks, and any number of less pleasant terms – have characteristics that set them apart from everyone else – even other Kindred. Their deformities may be physical, or they may tend toward having a powerful odor following them. Sometimes their curse even extends to create an unsettling air that surrounds them – more a psychological effect than a physical one. Whatever their bizarre handicap, Nosferatu are shunned, not only by the humans they rely on for sustenance, but also by other Kindred, who find them too unnerving and alien to tolerate easily. Much of the book is taken up by a series of journal-like entries of one Nosferatu – Nicodemus – traveling to other domains to interview his fellows regarding the nature of their clan and their curse. This documentation by Nicodemus is at the behest of another, more powerful member of Kindred society whom the author refers to as Master West. These entries are engaging reading, totally sucking me in any time I picked up the book, idly flipping through pages. They offer not only insight into the character of the Nosferatu, but also numerous ideas for NPCs and plot lines – enough to keep the average gaming group busy for months or even years. Necropolis with different chambers, either communal or private. By nature of their outcast status – and more than any other Kindred clan – Nosferatu tend to band together for self-defense and even companionship. Covenant may determine social cliques and create trends in association, but Covenant makes little difference as to which of the Haunts is allowed to share lodgings in the Necropolis. To quote from Vampire: the Requiem: “Tradition holds that any Nosferatu is welcome in any warren until she provides her brethren reason to expel her.” This attitude is unique among the Nosferatu; vampires are predators, and essentially compete with one another for the same food source. The Nosferatu are the only clan who tolerate each other to such a degree that they are willing to share their underground city with others of their kind. Arguably the best of the VtR clan books, Nosferatu succeeds brilliantly in making its subject matter sympathetic as a player character option. The wide variety of strange deformities exhibited in the clan is, admittedly, a source of morbid fascination, but also the startling touches of humanity exposed as layers of fear and loathing are stripped away makes the Nosferatu seem – at times – to be far more interesting characters than their less blemished Kindred counterparts. The Nosferatu – in game terms – can easily tend towards being brutal thugs and masters at manipulating fear in others, and yet the wide variety of characters presented in this book provide countless examples of variations on this central archtype, ranging from “carbon copy” to “no resemblance at all.” The sample characters provided at the back of the book practically hum with life; I want my own character to actually meet and interact with those characters in-game – they seem so well-developed and real, with genuine, complex motivations and backstories that were both blood-curdling and intriguing. version, graces pages 104-105. Its re-use does not rankle at all; in fact, I was pleased to see more of the overall image revealed deep inside the book, and found the metaphor highly appropriate. The depiction of Grigor Swancott on page 34 is quite haunting and vivid; likewise, the image of the “Bandaged Man” from page 103 will stay with me for quite a while. I’ve actually re-read much of this book several times since acquiring a copy. It is a testament to the depth and quality of writing that I often discover something I’d missed previously. 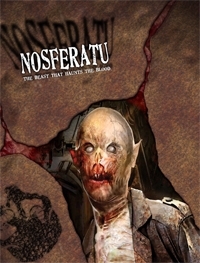 I cannot recommend highly enough that players of Vampire the Requiem, or indeed any fans of vampires and horror should consider obtaining a copy of Nosferatu, the Beast That Haunts The Blood, even if one has no plans to use the information in game terms. It is engrossing and enjoyable to read, and at a suggested retail of $20 for a print copy, it’s not going to break the bank. It is well worth the time and money to discover this book.